Home remodeling and renovation has been our specialty for well over a decade. Your home is a place where you should feel most comfortable. So when something in the design or layout isn’t working well, it can add stress to your life. We eliminate stress by providing affordable home improvement options that can dramatically improve the style and function of your house. If you have an unfinished or unusable basement, you are wasting valuable square footage in your home. With our finishing, renovation and design services, you can add value to your home and give your family a more comfortable lifestyle. Create a new family room with plenty of space for everyone or a mother-in-law suite where guests have privacy. 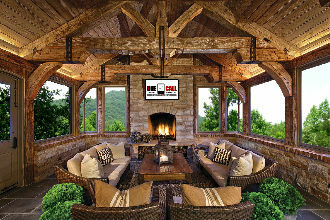 Indulge in a home theater, gym or other specialty design to accommodate your hobbies and passion. Your imagination is the limit! Just because your attic is dingy and dusty now doesn’t mean it has to stay that way. If you have the right amount of space, you can convert it into a living space that loved ones will fight over. Increasingly popular, attic lofts are the perfect location for a teen who wants independence or the treasured “man cave”. Our home remodeling contractors will help you choose the right design and build it beautifully. The other service we provide in the top space of your home is Attic Insulation. As a matter of fact, we’re often told about how much lower our customers utility bills are after installing brand new Owens Corning Pro-Cat Attic Insulation. It’s the best because it won’t hold moisture, never settles over time and keeps your insulating R-Value up high where it should be. When you’ve used every inch of existing square footage but you still need more, a room addition may be just the answer you’re looking for. We can build anything from necessities like extra bedrooms and bathrooms to more indulgent features like patio enclosures including sunrooms, screen rooms and covered porches. Getting the space you need is as easy as picking up the phone and calling us for a free estimate. And for the most complete home addition services available, we are also expert deck builders. On the exterior of the house, you’ll often see us doing a rain gutter installation, replacing windows & siding and even applying stucco or mortar-wash! There is just no limit to professional home renovation we can offer you. Your home can be what you want it to be. Trust our experience and our A+ rating with the BBB. We’re licensed, insured and ready to transform your home. Call now. We are a professional home remodeling company in Birmingham, Serving Hoover, Vestavia, Homewood AL, Trussville and Mountain Brook. A Reputable Home Remodeling Contractor! Let Us Show You How Affordable Home Remodeling Can Be! Birmingham, Hoover, Vestavia, Mountain Brook, Pelham AL, Trussville, Pell City, Rainbow City and Gadsden. Copyright © 2018 - Home Remodel Birmingham - All Rights Reserved.